Human Immunology publishes full-length, original, hypothesis-driven basic and clinical research articles as well as brief communications, reviews and editorials covering immunogenetics, transplantation immunology, autoimmunity, and immunity to infectious diseases in humans. It also publishes short population reports, which are tied to the allelefrequencies.net database, describing allele frequencies of HLA and KIR. The journal's scope includes understanding the genetic and functional mechanisms that distinguish human individuals in their immune responses to allografts, pregnancy, infections or vaccines as well as the immune responses that lead to autoimmunity, allergy or drug hypersensitivity. It also includes examining the distribution of the genes controlling these responses in populations. 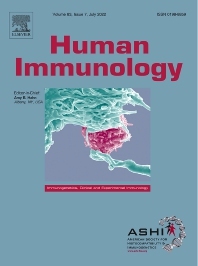 Human Immunology considers immune-related genes to include those encoding classical and non-classical HLA, KIR, MIC, minor histocompatibility antigens (mHAg), immunoglobulins, TCR, BCR, proteins involved in antigen processing and presentation, complement, Fc receptors, chemokines and cytokines. Other immune-related genes may be considered. Human Immunology is also interested in bioinformatics of immune-related genes and organizational topics impacting laboratory processes, organ allocation, clinical strategies, and registries related to autoimmunity and transplantation. Original papers with new data will be given preference over uninvited reviews and meta- analyses. As the flagship scientific publication of the American Society for Histocompatibility and Immunogenetics (ASHI), Human Immunology is primarily directed to readers with an interest in histocompatibility, immunogenetics, transplantation, anthropology/population studies, HLA disease association and pharmacogenomics. These include basic and clinical scientists as well as histocompatibility laboratory professionals.